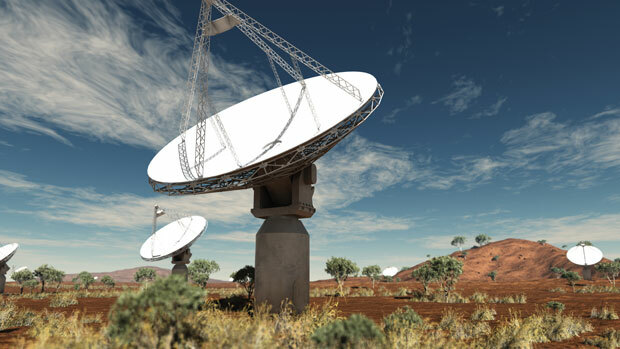 Precursor telescopes like the South African MeerKAT and the CSIRO’s Australian SKA Pathfinder (ASKAP) and Murchison Widefield Array (MWA) are providing SKA scientists with invaluable knowledge to assist in the design of the SKA’s main telescopes over the coming decade. Located at future SKA sites, these precursors are and will be in future carrying out scientific study related to future SKA activities, as well as helping the development and testing of new crucial SKA technologies..
MeerKAT, which is currently taking shape in South Africa’s Karoo region, will be a world-class radio telescope array in its own right and is designed to do ground-breaking science ahead of the SKA becoming operational in the early 2020s. Until that time, it will be the largest and most sensitive radio telescope in the Southern Hemisphere. MeerKAT itself will also form part of the main SKA array. Both ASKAP and MeerKAT will be operating ahead of the full SKA system coming online, and MeerKAT will integrate into phase one of the SKA, which will be building on their unique science capabilities and scientific output. ASKAP in Australia is also performing cutting edge scientific work ahead of the deployment of the huge swath of wide field low frequency antenna which Australia will host as part of the SKA.The 36 antennas which form ASKAP are already installed at the Murchison Radio Observatory (MRO) site in Western Australia. These are currently being equipped with their precision electronics designed to test many of the concepts which will apply to the SKA. Once the commissioning phase completed, ASKAP will start its first science observations and will provide world-class science as a foretaste of the future, eventually being integrated in the full SKA system. The SKA Science and Engineering Committee (now disbanded) approved the following SKA precursors, pathfinders and design studies, and you can click on the links to find out even more information on these remarkable telescopes. Pathfinder telescopes and systems, dotted around the globe are also engaged in SKA related technology and science studies. These include the famous Arecibo radio telescope in Puerto Rico, which starred in the James Bond movie “Goldeneye”, the LOFAR low frequency array, which is based in Europe, and the EVLA, in North America, which was famously seen in the hit movie “Contact”. Here is a list of SKA Pathfinders. The Square Kilometre Array Design Studies are an international effort to investigate and develop technologies which will enable the SKA. The following are part of this. US Technology Development Project (TDP). Further information about SKA precursors, pathfinders and design studies can be obtained from Colin Greenwood, Company Secretary. These definitions were approved by the SSEC (now disbanded) for use during the preliminary phase of the project. A telescope on one of the two SKA candidate sites, carrying out SKA-related activity. SKA-related technology, science and operations activity. A study of one or more major sub-systems of the SKA design, including the construction of prototypes. In order for a project or facility to be awarded the title of SKA precursor, pathfinder or design study, there must be a mechanism in place for communicating results to the international SKA project. These definitions were approved by the SSEC (SKA Science and Engineering Committee which is now disbanded) for use during the preliminary phase of the project. It contains new technical elements that have not been tried before on the scale of a large telescope and which are part of the SKA Reference Design – technology. It will carry out observational tests, both simulated and real, that explore new capabilities at flux density and dynamic range levels similar to or scalable to the full SKA – science. It tests methods of scheduling and allocating time similar, or scalable to, that needed for the SKA – operations. The SKA Organisation is the sole arbiter for designating national, regional, and institutional contributions to the SKA as precursor, design study or pathfinder. In all cases, there must be a clearly defined path for the results of the activity to reach, and potentially influence, the international SKA project, and this should be officially recognised by the SKA Organisation before the designation precursor, design study or pathfinder can be adopted.